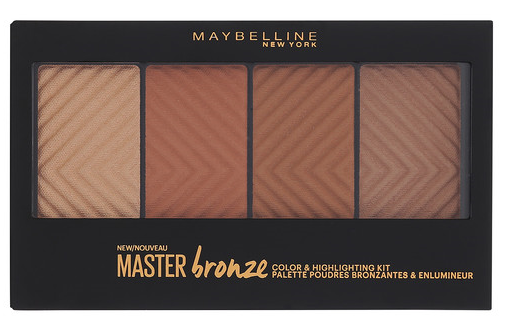 The Maybelline Master Bronze Palette is brand new for Summer 2017 and I grabbed one as soon as I saw them pop up on Amazon so I could try it before it hit the drugstores. Since I'm fair and I have a difficult time finding a bronzer that's not too dark or too warm (orange), I don't usually gravitate toward palettes. I tend to just seek out one color that will work with my skin tone and buy the single version. However, this one was really affordable and I admit that I got sucked in by the pretty chevron pattern that was stamped into it. But as you can see below, mine arrived with no chevron pattern, even though it was advertised that way (see photo above). It's also not nearly as dark or as warm as it appears in the stock photos. When mine first arrived, I was a little concerned that maybe I got a fake palette, since there are sometimes knockoffs on Amazon, so I reached out to Maybelline on Instagram. They confirmed that the first run of palettes do not have the pattern but they will be launching it that way later in the summer. 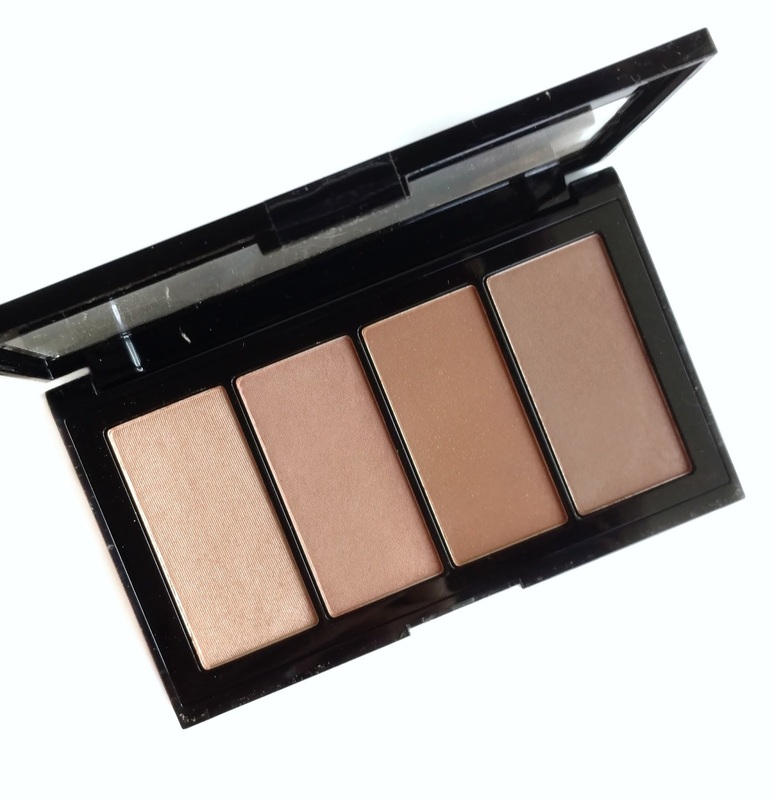 Included in this palette are three bronzers and highlight shade. The highlight is a light gold with a shimmery finish. The lightest bronzer has a little bit of sheen to it (not shimmery but more like a satiny finish) and it also has a bit of a rosy tone. The middle bronzer is the warmest in color and has a matte finish. The deepest bronzer is cooler in tone (great for contouring) and also has a satiny finish. The formula is very buildable so this is not what I would call "in-your-face" when it comes to pigmentation. When you touch your brush to the pans, there's almost no powdery kick-up at all...they're very firmly pressed. This means that you don't get a ton of product on your brush so the first application will be really light...then you can go back in and add more as needed. Personally, I really like that these aren't super pigmented because just like with blush, I'm always afraid of overdoing it with bronzer and I prefer to go slowly when applying it. Also, if you're a bronzer novice, this palette would be a great option because you can't really mess it up. The highlight shade is subtle and not too shimmery but it still shows up nicely on the skin. I also love that they included three very different bronzer tones in here...you have a rosy tone (which looks the most like a "real" tan you would get from the sun), a warmer tone (to give some warmth to your skin), and a cooler tone (for contouring or shading). The powders are also very blendable and silky so you don't have to worry too much about it getting streaky. 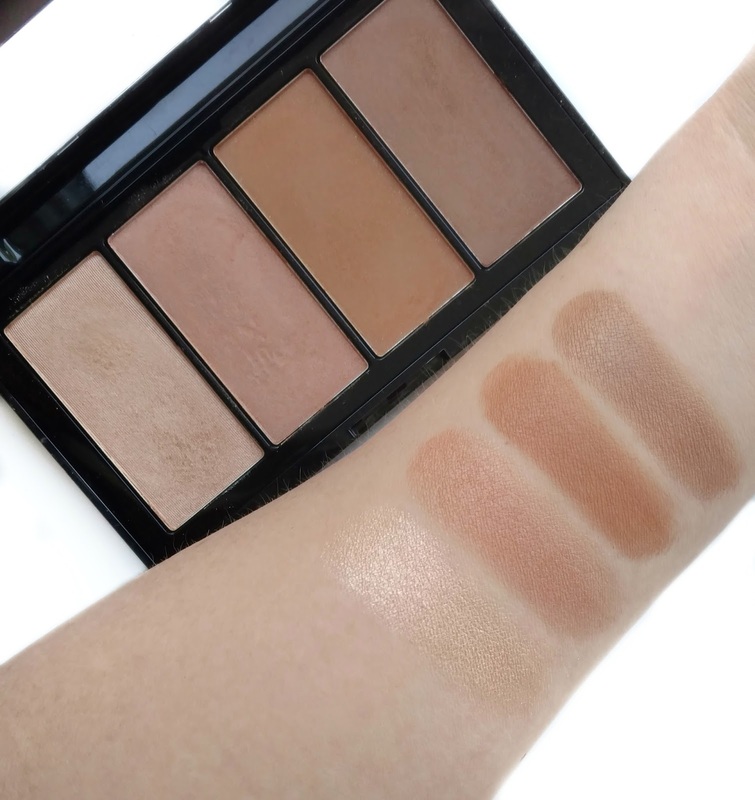 Overall, I think that the Maybelline Master Bronze palette is a really nice bronzer wardrobe for those with fair to medium skin tones, and also for beginners. The satin and matte finishes give a natural look and the buildable formula pretty much guarantees you won't overdo it. However, if you like your bronzers to be more pigmented, more shimmery, or if you have a deeper skin tone, you probably won't like this one. Available now for $12.99 at Ulta.com and soon to be in drugstores. *Disclosure: Purchased by Me. Links are affiliate links. I wasn't all that interested in this palette when I saw it online but after your review I think I'll check it out. I also don't like my face products to be overly pigmented. I got a bronzer a few weeks ago that was so pigmented it left a dark spot where I touched the brush to my skin and was impossible to blend away, it just sat there. Needless to say I had to wash my face and start over. Grr! This is my kind of bronzer palette! I'm about to place an Ulta order tonight (for the new Tarte stuff) so I'm adding this to my cart.